Background: Patients undergoing radiation therapy for oral squamous cell carcinoma (OSCC) have an increased risk of developing oral candidiasis. Radiation-induced hyposalivation is thought to be a major predisposing factor for it. Radiation therapy for 2–3 weeks leads to increase in the number of candidal species in the oral cavity, eventually leading to oral candidiasis. Objective: To evaluate and correlate the prevalence of candidal species in the oral cavity of OSCC patients and to compare with radiation dosage at 3rd and 6th week following radiotherapy. Materials and Methods: This study includes fifty patients undergoing radiation therapy for OSCC. Patients were examined at 3rd and 6th week following radiation therapy, and smear samples were obtained from lesional sites and the radiation dose was recorded. Smear samples were cultured on CHROMagar, and identification of various candidal species was done on the basis of colony color and their morphology. Results: The present study isolated four types of candidal species, namely, Candida albicans, Candida glabrata, Candida tropicalis and Candida krusei. All the organisms, except C. krusei, showed a significant increase from 3rd to 6th week of radiotherapy whereas C. glabrata and C. tropicalis showed a sudden exponential increase. Total radiation dosage did not show any correlation to candidal colonization at 3rd and 6th week following radiotherapy. Conclusion: OSCC patients undergoing radiotherapy show an increase in candidal colonization which is independent of radiation dosage and may be related to other factors. However, such findings should be further evaluated using a larger sample size. Background: Early detection of oral squamous cell carcinoma (OSCC) remains one of the most efficient ways to ensure patient survival and improved quality of life. Although specific biomarkers related to OSCC have been investigated, a useful biomarker that assesses the transition potential of potentially malignant lesion to OSCC remains to be found. Osteopontin (OPN) has been recognized as an important factor in tumorigenesis and their expression in OSCC have been investigated earlier. In the present study, evaluation of OPN expression in premalignant and malignant lesions has been carried out to assess their possible role as a biomarker in the early diagnosis and prognosis of OSCC. Objectives: The objective of this study is to evaluate the role of OPN as a biomarker in the diagnosis and prognosis of OSCC. Materials and Methods: The study group consisted of archival paraffin-embedded blocks of ten cases each of varying grades of OSCC, oral epithelial dysplasias and epithelial hyperplasias. 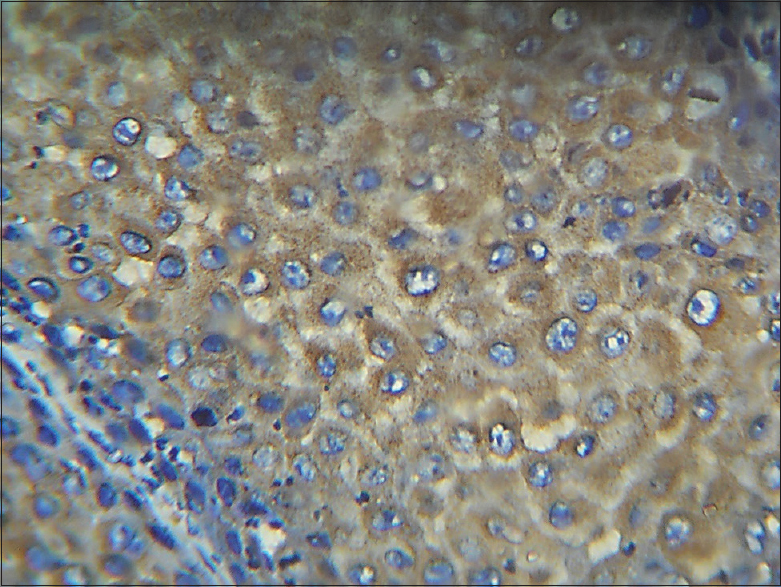 Sections were subjected to immunohistochemical staining for the biomarker OPN. Results: A positive OPN expression was noticed in epithelial dysplasias and SCC arising from the oral epithelium. A progressive increase in the intensity of staining was seen with increasing grades of dysplasias and a decrease in OPN expression with an increase in grades was observed in OSCC. Conclusion: The expression of OPN in full thickness of epithelium in severe dysplasias, carcinoma in situ, and in the superficial epithelium of OSCC suggest the possibility of considering OPN expression in full epithelial thickness in dysplasias as an indicator for malignant transformation. Context: Oral squamous cell carcinoma (OSCC) is a malignant neoplasm of epithelial tissue origin. OSCC is traditionally graded into well, moderate and poorly differentiated. The assessment of cellular and nuclear features is very important in the histological grading of OSCC. Aims: To establish morphometric study as an important prognostic indicator of OSCC. Settings and Design: The present study is undertaken for computer-assisted morphometric evaluation of the following parameters: changes in cell perimeter, nuclear perimeter (NP), cell area (CA), nuclear area (NA) and nuclear-cytoplasmic ratio (N:C) in twenty cases of OSCC and ten cases of normal oral mucosa. Subjects and Methods: The hematoxylin- and eosin-stained sections were observed under microscope for dysplastic features. For morphometric analysis, images were captured with a 2MP camera attached to a NLCD 307 microscope (Lawrence and Mayo India Pvt., Ltd.,) with a ×40 objective used for morphometric analysis. The images were classified, transferred and stored in the computer for image analysis. Statistical Analysis Used: One-way analysis of variance is used for comparing the parameter for multiple groups followed by Mann-Whitney U-test for pair-wise comparisons. Results: Highly significant difference was seen between cases and controls with respect to CA, NP and NA. Highly significant difference is seen in N:C ratio between the means of cases and control groups. Conclusions: Techniques of image analysis offer an opportunity to quantify the nuclear and cell changes associated with malignancy and provide an objective basis for grading dysplasia and tumors. Introduction: Oral submucous fibrosis (OSMF) is also considered as an Asian version of sideropenic dysphagia, wherein chronic iron deficiency leads to mucosal susceptibility to irritants, such as chillies and areca nut products. Hemoglobin (Hb) levels, in particular, serum iron levels, are considered as biochemical indicators for nutritional assessment. Serum iron content can thus be a predictor for the progression of the condition, and there appears to be an association between serum iron content and oral carcinogenesis. Therefore, biochemical assessment of oral precancerous conditions may help in early diagnosis and prognosis. Hence, the present study was aimed to evaluate Hb, serum iron, total iron-binding capacity (TIBC) and serum ferritin in OSMF patients. Materials and Methods: Forty cases of OSMF were staged clinically and graded histopathologically to assess the levels of Hb, serum iron, TIBC and serum ferritin and compared with normal subjects. The results were compared using t-test, ANOVA, and Tukeys multiple post hoc procedures. Results: It was observed that the levels of Hb, serum iron and serum ferritin levels gradually reduced in OSMF patients compared with controls and as the clinical stage and histological grade of OSMF progressed with a statistically significant P < 0.05. It was observed that the levels of TIBC gradually increased in OSMF patients compared with controls and as the clinical stage and histological grade of OSMF progressed with a statistically significant P < 0.05. Conclusion: The Hb, serum iron and serum ferritin levels in OSMF patients were reduced and TIBC increased as compared with controls and as the clinical stage and histological grade of OSMF advances indicating their role as a reliable biochemical indicator. Background: Oral submucous fibrosis (OSMF) is a chronic oral mucosal disease characterized by progressive deposition of collagen in subepithelial connective tissue and epithelial atrophy. The present study was conducted to evaluate the changes in epithelial thickness and cellular and nuclear morphometric characteristics of parabasal and spinous compartments of the epithelium in various stages of OSMF in comparison to normal epithelium. Materials and Methods: Sample included 30 cases of OSMF of various stages and five cases of normal buccal mucosa. 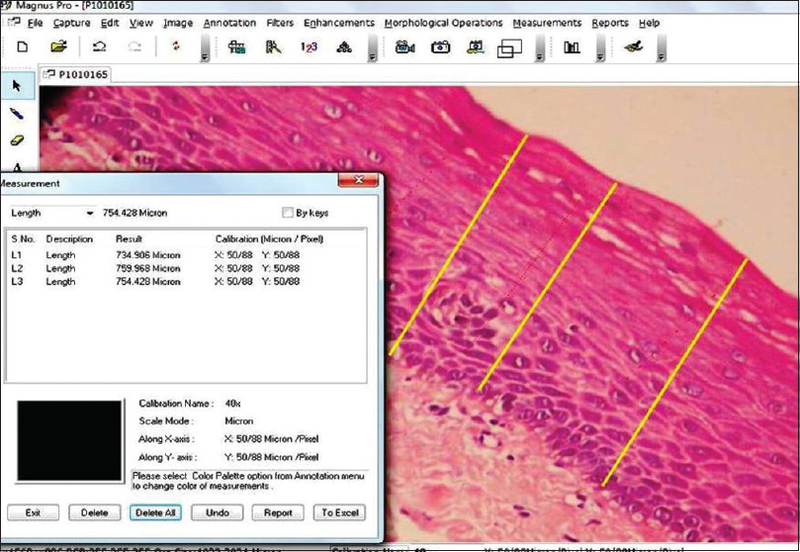 Measurements for epithelial thickness and cellular morphology using morphometric analysis were performed on captured digital images using image analysis software. Statistical Analysis: The ANOVA analysis of epithelial thickness and correlation of epithelial thickness with cell contour and cell roundness was done using Karl Pearson's coefficient of correlation. Results: There was a statistically significant decrease in epithelial thickness with increase in severity/stage of OSMF. It was also observed that there is a highly statistically significant correlation (P = 0.000) between the thickness of epithelium and cell morphology in varying stages of OSMF. 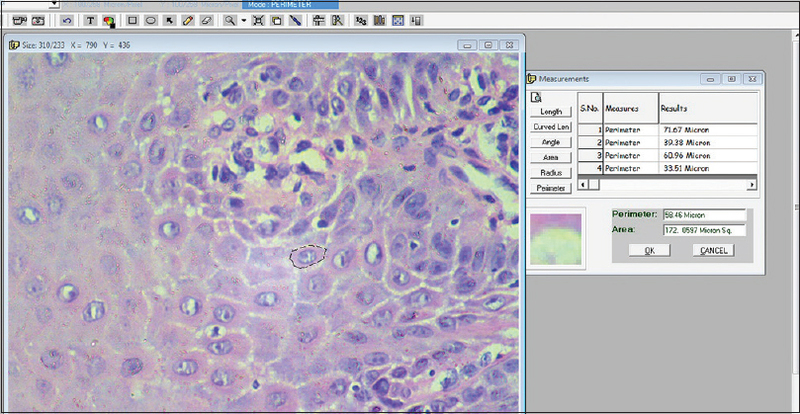 Conclusion: The morphometric parameters and the use of quantitative histological methods in determining the squamous epithelial structures thus made it possible to evaluate that there is reduction in thickness of epithelium or “atrophy” with increasing stages of OSMF which may be due to actual change in cell morphology of the individual cells of specific compartment or all compartments in the epithelium. Background: Oral submucous fibrosis (OSMF) is a progressive disorder affecting the oral mucosa. OSMF predominantly seen in South-east Asian countries. There are some biochemicals parameters which are modify in oral submucous fibrosis; this alteration can be used as a tool for diseases progress and avert malignant transformation. Aims and Objectives: The aim of this study is to evaluate the serum malondialdehyde (malondialdehyde [MDA]), and Superoxide dismutase (SOD) in oral sub mucous fibrosis cases and compare clinical stages. Materials and Methods: Thirty cases of clinical and histopathological established oral submucous fibrosis and thirty cases of nonsymptomatic features of oral submucous fibrosis preferred as controls. Venous blood was collected and separation of serum for estimation of MDA and SOD levels was done using an ultraviolet spectrophotometer. Statistical Analysis: Data were analyzed using SPSS software using Student's t-test and Kruskal–Wallis ANOVA test. Results: Serum MDA levels were elevated when clinical staging increases, where as SOD levels were decreased when clinical stage increases when compared with control cases and it showed stastically significant. Conclusion: Estimation of serum MDA and SOD in patients with OSMF, we can assess the degree of oxidative damage of the disease. This can be used as an early diagnostic tool for preventing malignant transformation of oral submucous fibrosis. Context: The salivary glands are the site of origin of a wide variety of neoplasms and are also relatively uncommon. The histopathology of these tumors is said to be the most complex and diverse of any organ in the body. The incidence of salivary gland tumors (SGTs) is claimed to be influenced by geographical and racial factors. Histopathological diagnosis plays a major role in the diagnosis of these neoplasms, with very few contribution using special stains, immunohistochemistry and cytogenetic studies. Aims: Aimed at understanding the epidemiological pattern of these tumors and to compare our findings with reports done elsewhere. Settings and Design: This is a retrospective study done at Pathology Department a Postgraduate Teaching Hospital, Tertiary Care Centre in Bagalkot, Karnataka, India. All the cases of SGTs, which had been recorded in a 3-year period from 2009 to 2012, were enrolled in the study. Subjects and Methods: Clinical data were recorded and analyzed with respect to gender, age, site and histopathologic type. Results: Data of 59 cases of SGTs were recorded, of which 43 (69.16%) cases were classified as benign tumors and 16 (22.39%) cases as malignant tumors. Male to female ratio (M/F) and the mean age of patients were 1:1.8 and 43 years, respectively. Pleomorphic adenoma (60.71%) and adenoid cystic carcinoma (14.94%) were the most common benign and malignant neoplasms. Conclusions: Although the SGTs encountered were similar in most of their characteristics to those reported in India and other countries, some differences such as relative frequency, age and gender prevalence were discovered. Objectives: Since its recognition as a physiologic process associated with tumor, among molecular mechanisms involved in tumor progression, defects in regulation of apoptosis have generated an accelerating volume of research that has sought to elucidate the role of programed cell death in pathogenesis and treatment of various tumors. Therefore, this study was performed to understand better the diverse biological profile of epithelial odontogenic tumors with the help of immunohistochemical expression of Bcl-X protein. Materials and Methods: We studied Bcl-X protein expression in 45 cases of epithelial odontogenic tumors which included 15 cases each of ameloblastomas, keratocystic odontogenic tumor (KCOT) and adenomatoid odontogenic tumor (AOT) and correlated the expression with their growth pattern. Results: Cytoplasmic staining of Bcl-X revealed overexpression in ameloblastoma when compared to KCOT and AOT. Percentage of positive cells showed a statistically significant difference, P = 0.007 between ameloblastoma and KCOT, whereas P < 0.001 between ameloblastoma and AOT. However, no significance was observed between KCOT and AOT (P = 0.132). Conclusion: The present study supports the fact that epithelial odontogenic tumors show diverse growth profiles. An increased Bcl-X expression was seen in ameloblastoma compared to KCOT and least expression in case of AOT which could be indicative of more aggressive biological behavior and increased cell survival activity of ameloblastoma than KCOT and AOT. This signifies the diagnostic relevance of this biomarker and also could be a possible regulator of the proliferative compartment by contributing in tumor progression and cytodifferentiation of epithelial odontogenic tumors. Introduction: Over the past century, the dental literature has consistently reflected a controversy related to the effect of periodontal disease on the dental pulp. Nonetheless, practitioners are of the opinion that teeth having deep periodontal pockets show variable pulpal response, which may necessitate root canal treatment. Thus, this study aimed to evaluate the changes in pulp due to advanced periodontal disease. Materials and Methods: Forty caries-free teeth affected with severe periodontitis were collected from patients aged between 18 and 55 years. 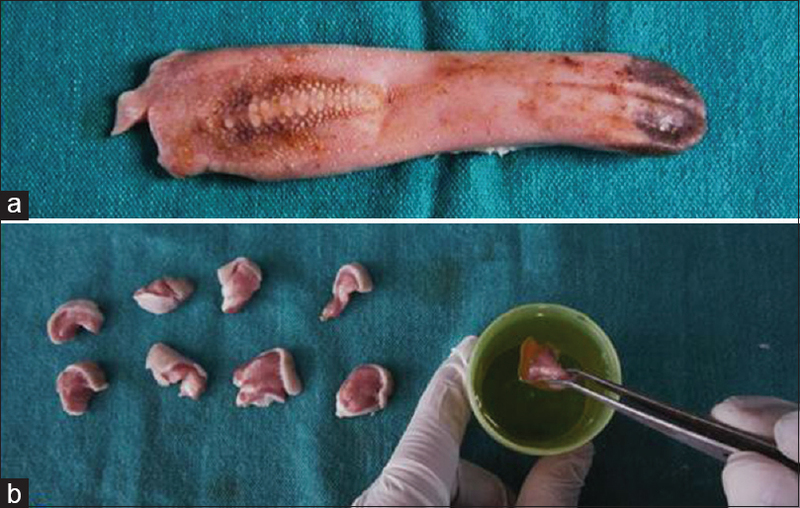 The collected teeth were stored in formalin for 24 h and were then decalcified and examined histologically after staining with hematoxylin and eosin to note the changes that occurred in pulp. 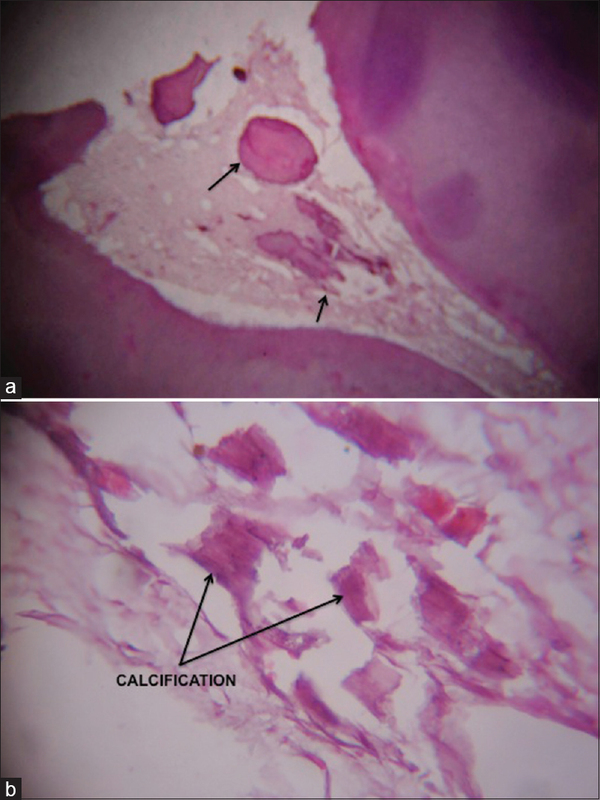 Results: Pulpal calcification (52.62%) and partial necrosis of pulp (52.62%) were found to be the most common findings. Inflammation, which was found in 47.38% of the cases, ranged from mild to severe in most sections and was always chronic. Pulp with complete necrosis was seen in 26.32% of cases. Fibrosis and pulpal edema were seen in 36.84% of cases. Conclusion: In the presence of moderate to severe chronic periodontitis, degenerative changes such as inflammation, fibrosis, edema, calcification and necrosis were observed to variable degree. Background: Formalin is widely used to fix histological preparations and as preservatives in embalming solutions and is an age-long practice in medical laboratories. It is generally accepted that the risk of contracting infections is relatively high among medical laboratory workers and pathologists. Recent studies have, however, suggested that formalin does not effectively inactivate all kinds of microbes in formalin-fixed tissue (FFT). Long time preserved tissues in formalin may develop growth of microbes on the surface of the formalin. Aims and Objectives: The purpose of the study is to determine the growth of microorganisms on the surface of FFTs. Materials and Methods: Fifty-one containers of 10% formalin with fixed tissues and undiscarded formalin solution not containing tissues of years 2013–2015 (17 in each year) were selected, and samples for inoculation onto the cysteine lactose electrolyte deficient agar plates were taken from the surface of the FFT using sterile cotton tips. The growth of the colonies was checked for after 48 h. Results: Out of 51 samples from 2013 to 2015, 17 had shown growth of microbial colonies. Six out of 17 samples of 2013, 7 out of 17 of 2014 and 4 out of 17 samples of 2015 had colonies of microbes on agar plates. Gram-negative bacilli, Bacillus subtilis and micrococci were mostly found. Conclusion: There were viable microbes on the surfaces of formalin solution containing pathology tissue. 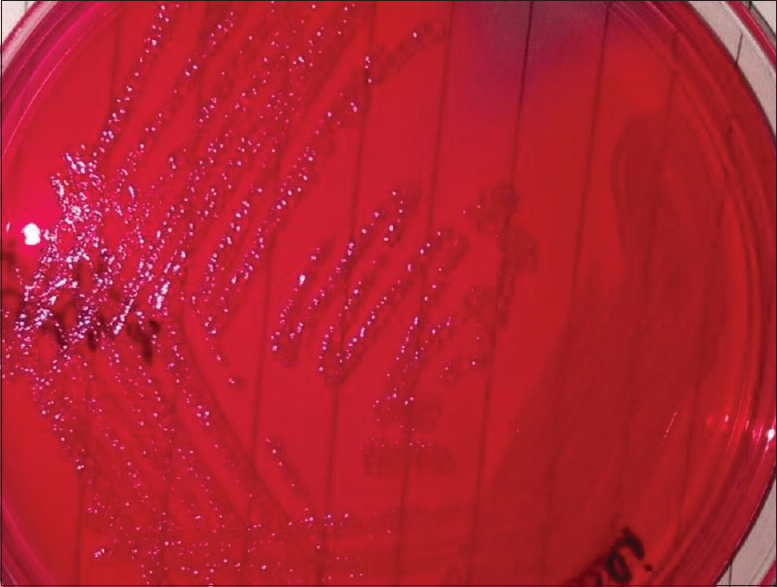 Since cross-contamination by microbes may occur during regrossing or processing, protocols to decrease cross-contamination should be instituted. Introduction: All good tissue specimen preparations require complete fixation. The process of tissue handling and processing from patient to paraffin block is too frequently invisible to the pathologists. Many times due to certain emergencies or unavailability of a proper fixative, tissues are kept in different carrying media such as normal saline (NS) or local anesthetic till the availability of a proper fixative solution. This fixation delay can lead to various tissue architectural changes which can affect its diagnostic value. Aims: The aim of this study was to assess sectioning ability, staining intensity and microscopic details of tissues kept in different carrying media at different time intervals followed by standard fixation. Materials and Methods: Fresh tissue specimen, i.e., goat tongue was collected and its middle portion was retained and was used for study purpose. The tissue was grossed and kept in various carrying media for five different time intervals. Standard formaldehyde fixation was then carried out followed by sectioning and staining. The sections were evaluated histologically under light microscope. Statistical Analysis: For sectioning parameter, Fisher's exact test and for staining and microscopic details, Mann–Whitney U-test was used. Results: According to the study, NS is considered as a best carrying media followed by 10% honey and local anesthetic. Two percent hydrogen peroxide cannot be used as a carrying media. Conclusion: It was concluded that NS should be given first preference as a carrying media till the availability of a suitable fixative. Clinicians and Pathologists should have to familiarize themselves with the advantages and disadvantages of using various carrying media and the histomorphometric changes associated with delayed fixation which may lead to incorrect diagnosis. Background and Aim: Indian patients with oral squamous cell carcinoma (OSCC) are etiologically associated with the use of tobacco and alcohol; yet, a proportion of tumors that may harbor human papillomavirus (HPV) infections cannot be neglected. The following meta-analysis was conducted to address the association of p16INK4a and HPV DNA with OSCC. In addition, the study also provides the updated prevalence of HPV-induced OSCC. Materials and Methods: Literature survey was performed using databases such as PubMed with the help of the following keywords – “HPV infection,” “oral squamous cell carcinoma,” “p16INK4a,” “HPV DNA,” “E6,” “E7,” “L1,” “L2” and “LCR.” Proportion method was performed to derive the forest plot using MedCalc statistical software version 16.4.3. Results: Among 145 research articles, 33 articles were selected for further analysis, in which 13 articles were related to HPV DNA detection in tissues, 11 articles detected the overexpression of p16INK4a and nine articles reported the detection of both HPV DNA and p16INK4a expression. 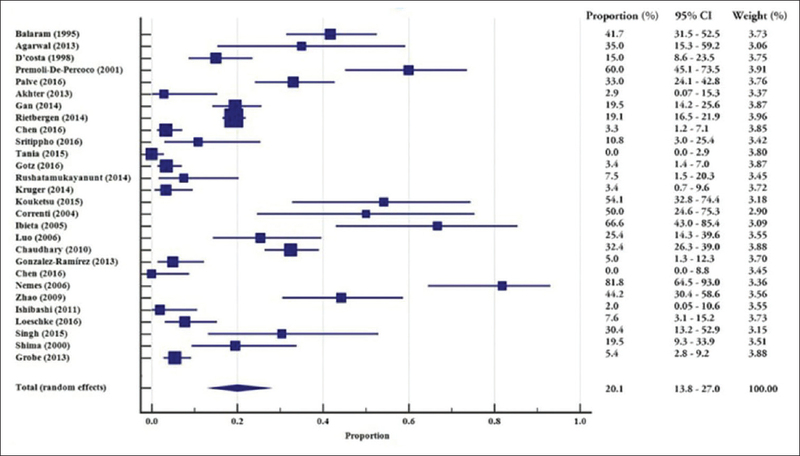 Meta-analysis revealed significant heterogeneity (P < 0.0001) among the articles. Overall, the study consisted of 3339 patients with OSCC, among which 559 patients were diagnosed with the presence of HPV16 DNA with a random proportion of 20.1% at 95% confidence interval (CI) (13.9–27.1, P < 0.0001). Overexpression of p16INK4a protein was observed in 709 patients with a random proportion of 25.4% at 95% CI (14.3–38.3, P < 0.0001). Conclusion: HPV DNA and expression of p16INK4a was suggested as gold standard for the detection of HPV infection in many cases of cancers. Frequency of HPV infection is significantly higher in patients with OSCC as identified through the detection of HPV DNA and p16INK4a expression. Even though the association of HPV infection has been established in head and neck cancer, this review could further the establishment of molecular level interaction of HPV in patients with oral cancer. Candida albicans represents the most common commensal and opportunistic fungal pathogen colonizing humans. As a member of the normal microflora, it is present on the skin and the mucous membranes of the upper respiratory tract, gastrointestinal tract and female genital tracts. It is therefore not transmitted. It lies in wait for a change in some aspect of the host physiology that normally suppress growth and invasiveness through an enigmatic phenomenon called Phenotypic Switch System or White-Opaque Transition. This system involves reversible and heritable switching between alternative cellular phenotypes. 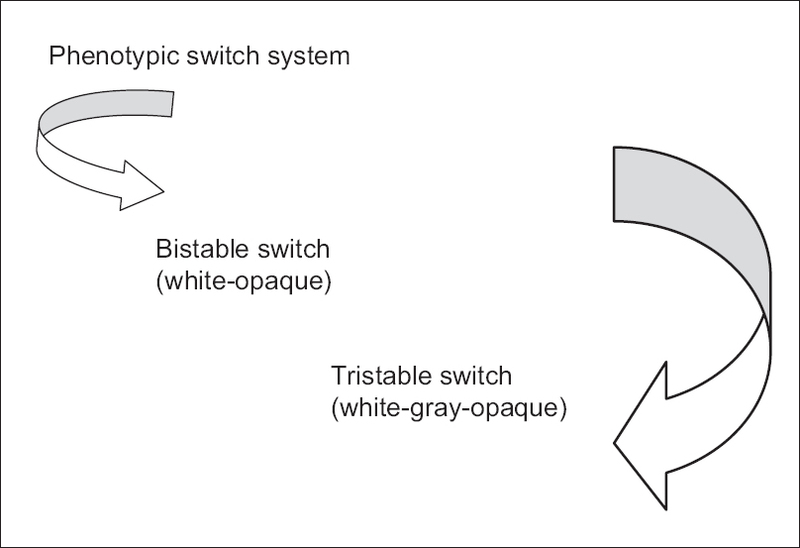 White–opaque switching in Candida albicans was first discovered in 1987. This was initially identified in strain WO-1. Switching has been demonstrated to occur at sites of infection and to occur between recurrent episodes of infection in select cases esp. AIDS and diabetes. Telomeres are repetitive ribonucleoprotein complexes present at ends of chromosomes. To synthesize this manuscript, a thorough literature search was done using PubMed, MEDLINE and Cochrane review for English-language literature and data available from the period of 2005–2016 were analyzed for manuscript writing. Telomeres help in maintaining the cellular health, inbuilt cellular mechanisms, metabolism and normal cell cycle. Telomerase is a specialized enzyme that possesses catalytic subunits - reverse transcriptase, Terc and dyskerin. Mutations affecting telomere or any component of telomerase enzyme result in disorders such as dyskeratosis congenita, aplastic anemia, myelodysplastic syndromes and leukemias. Thus, it is important to understand the telomere biology so as to deal with normal physiologic processes such as apoptosis, aging and senescence and tumor development. There are intense published data in literature related to cell engulfment phenomena such as emperipolesis, entosis and cell cannibalism. All these are closely related phenomena with a very fine line of differences. Its correct identification has a significant diagnostic and prognostic value. After extensive literature search, a gap of knowledge was found in concept designing and clarity about understanding of aforementioned terminologies. 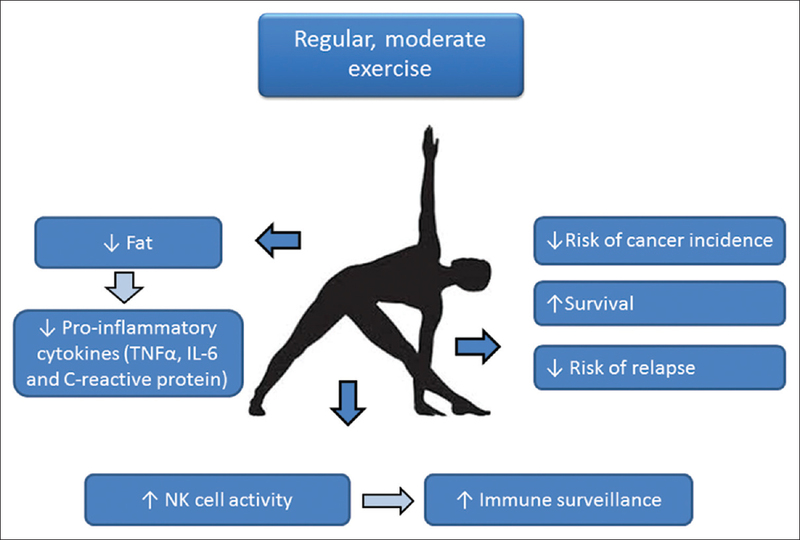 The authors have attempted to review data of these closely knit terminologies and further organize its characteristic appearances, pathogenetic aspects and prognostic implications. The data published in English Language, from 1925 to 2015, were collected using keywords such as emperipolesis, entosis and cell cannibalism through scientific database systems such as MEDLINE, Science Direct, Cochrane Library and Google Scholar. Articles were selected which have focused to explain the phenomenon, presentation and pathogenesis of one or more of this phenomenon. A total of 48 articles were retrieved, thirty of which were selected. The various cell engulfment phenomena are very similar looking but operate through entirely different pathways. The advancements in the fields of technology and networking have revolutionized the world including the fields of medicine and dentistry. Telemedicine and its various branches provide a broad platform to medical professionals for consultations and investigations and can also act as a valuable educational aid. 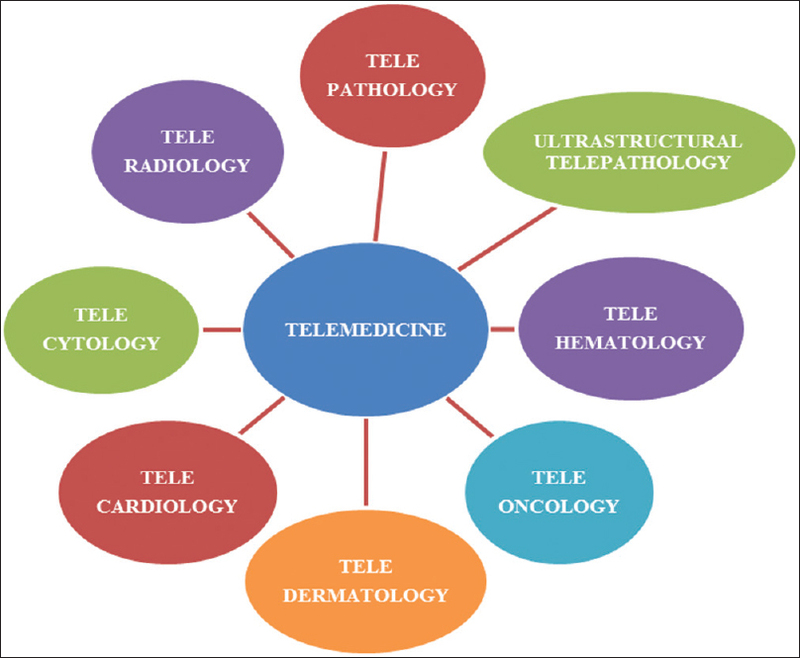 This review highlights the components, methods employed, clinical applications, advantages, disadvantages of telepathology and telecytology. 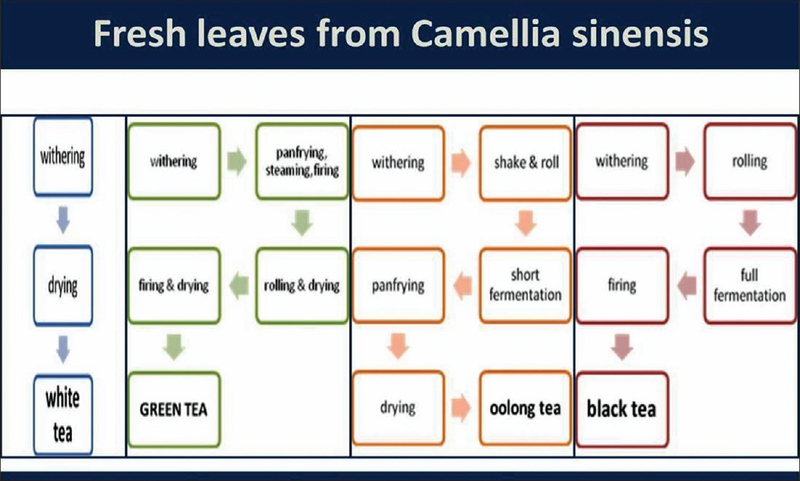 Tea is produced from the Camellia sinensis plant and can generally be divided into categories based on how they are processed. In general, green tea that is unfermented C. sinensis has been considered superior to black tea in health benefits. It contains a unique set of catechins that possess biological activity as antioxidant, anti-inflammatory and antiproliferative, which is potentially significant to the prevention and treatment of various forms of diseases. Oral cavity oxidative stress and inflammation, consequent cigarettes due to nicotine and acrolein, may be reduced in the presence of green tea polyphenols. In addition, green tea polyphenols can close down halitosis through modification of odorant sulfur components. Usually, green tea defends healthy cells from malignant transformation and locally has the ability to induce apoptosis in oral cancer cells. In unison, there is an increasing implication in the health benefits of green tea in the field of oral health. This review will cover recent findings on the therapeutic properties and anticancer health benefits of green tea. Keratoacanthoma (KA) is a benign epithelial tumor which presents clinically as a proliferating dome-shaped keratin-filled crater. The lesion occurs predominantly upon sun-exposed areas of the body and is known to arise from hair follicle. Actinic rays are a major contributing factor in the etiology. It simulates grossly as well as microscopically a low-grade squamous cell carcinoma. KAs occur habitually on the mucous membrane as well, but their origin in these cases is debatable, owing to the lack of hair follicles in these sites. Our report is an attempt to demonstrate the cells that could be responsible for initiation of this lesion on the oral mucosa. Spindle cell carcinoma (SpCC), a variant of squamous cell carcinoma, is a biphasic malignant neoplasm that occurs mainly in the upper aerodigestive tract. It is uncommon in oral cavity, accounting for <1% of all tumors in oral cavity. Furthermore, it is uncommon for oral potentially malignant disorders such as leukoplakia to undergo transformation into SpCC. 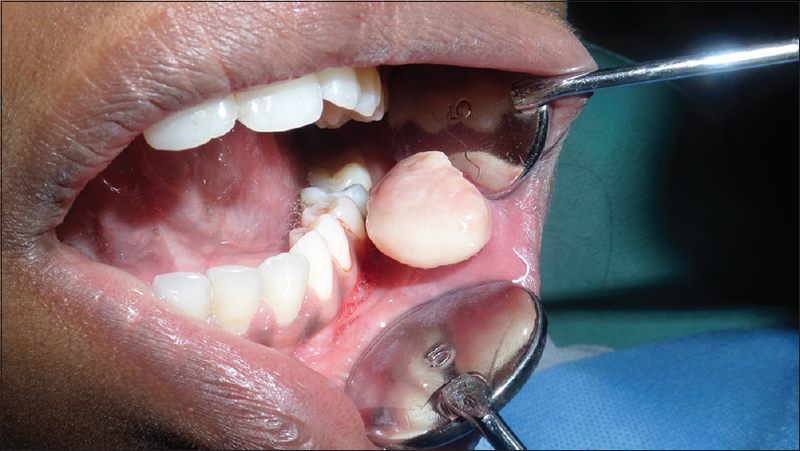 In this paper, we are reporting a case of SpCC of buccal mucosa in a 35-year-old female who was previously diagnosed with oral leukoplakia past 6 months. Neurilemmoma, neurinoma or schwannoma is a benign tumor of neurogenic origin, arising from the myelin sheath of a neuron. Head and neck region accounts for 25%–48% of these tumors reported till date. On the contrary, intraoral sites form only 1% of the cases accounted. Although a few cases of intraoral neurilemoma of mental nerve has been reported in English literature, none has been reported to arise from the terminal fibers of the mental nerve. 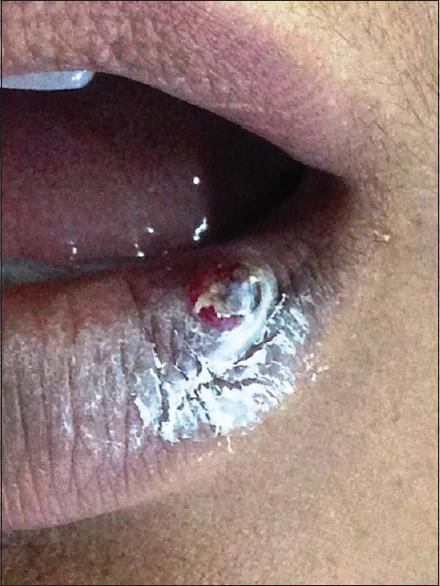 In this particular article, we present a case were the tumor was noted in the lower labial mucosa. We present an extremely rare case of noninfiltrating angiolipoma (AL) of the buccal mucosa in a 90-year-old patient reaching a size of 14 cm × 10 cm. AL is rare in the soft tissues of oral cavity, and till date, only 22 cases have been reported, including our case. If size be taken into consideration, our case can be considered to be the first in literature to reach this massive size. Surgical excision of the tumor mass was performed. 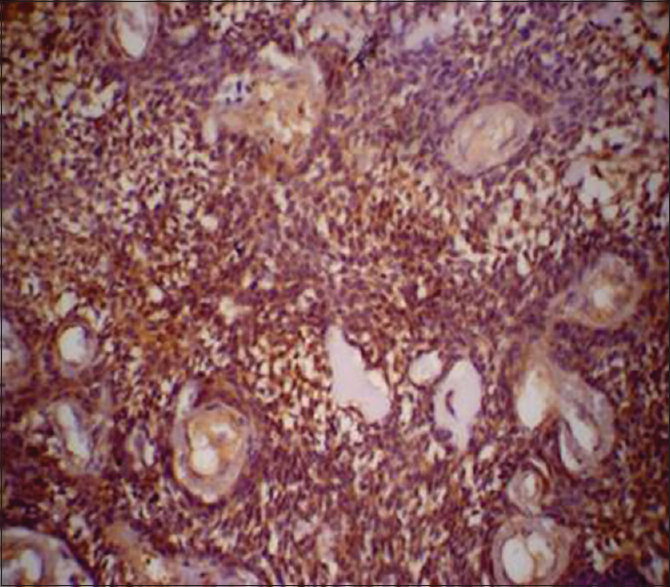 The histopathological findings confirmed the diagnosis of noninfiltrating AL. Follow-up for 1 year revealed no signs of recurrence. Mesenchymal chondrosarcoma (MC) is a rare variety of chondrosarcoma (CS), which is both clinically unique and histologically distinct compared with conventional CS. Maxillofacial MCs are aggressive, have a tendency for recurrence and significant distant metastasis to lung and bone, and are associated with overall poor prognosis. Histopathologically, it is a biphasic tumor comprising of islands of hyaline cartilage with undifferentiated small round cells. Here, we present an interesting case of MC involving the left half of maxilla along with a brief review of the relevant literature. Inflammatory pseudotumor is a term given to different neoplastic and nonneoplastic entities that have a common histological appearance, which comprises spindle cell proliferation with a prominent chronic inflammatory cell infiltrate. Inflammatory myofibroblastic tumor (IMT) is an uncommon lesion with distinctive clinical, pathological and molecular features and is considered to be pseudotumor for the past two decades due to its appearance. IMT is an intermediate soft tissue tumor which was first observed in lungs. It was named as IMT because it mimics a malignant neoplasm clinically, radiologically and histopathologically. The most common sites are lungs, liver and gastrointestinal tract. IMT in head and neck region is exceptionally rare and the sites reported include gingiva, tongue, hard palate, mandible, buccal mucosa and submandibular salivary gland. Till now, 8 cases of intramandibular IMT were reported. Here, we report an additional case of intramandibular IMT in a 20-year-old male patient. Langerhans cell histiocytosis (LCH), previously known as histiocytosis X, is an uncommon hematological disorder affecting infants and young children. It is the condition characterized by uncontrolled stimulation and proliferation of normal antigen presenting cells, Langerhans cells. Because of its relatively low incidence, limited data are available regarding the epidemiology of LCH, with estimation of 2–5 cases per million inhabitants per year. 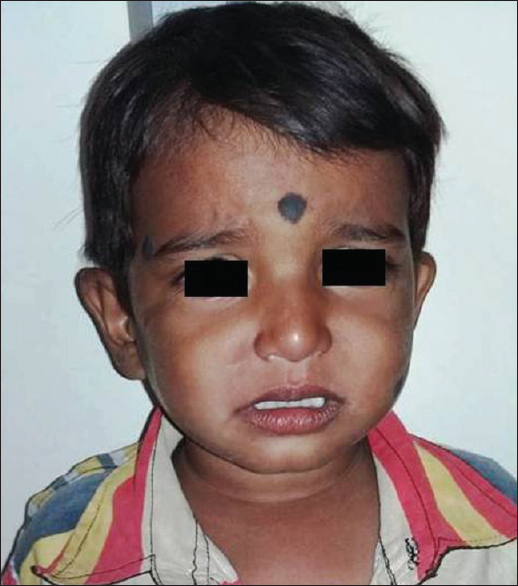 The purpose of this report is to describe the case of LCH in the 3-year-old male child with multiple focal involvements of bones and to discuss clinical, radiological and histopathological features of LCH and role of the dental surgeon in diagnosing and managing such lesions. Fusion is an anomaly manifested in both deciduous and permanent dentitions. Triple tooth refers to the union of three separate tooth entities. It can involve the normal dentition or supernumerary teeth. Triplication is rarely encountered in deciduous and permanent dentition with an incidence of 0.02%. 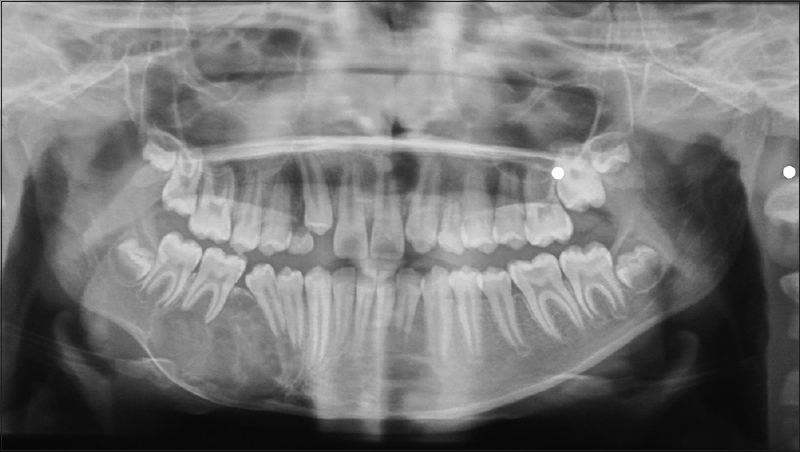 The case presented herein describes a rare case of triplication in permanent maxillary incisors and supernumerary teeth in a 15-year-old female. Central odontogenic fibroma (COF) represents a rare group of benign odontogenic tumor, while dentigerous cyst (DC), on the other hand, is the odontogenic cyst that encloses the crown of an unerupted tooth. A combination of COF and DC is rare and not reported in literature till date. The aim of this paper is to report a case of COF occurring concurrently with DC. The simultaneous occurrence of COF and DC raises the question of whether it is a collision tumor or their simultaneous occurrence is just a coincidence. In our case, the probable cause of simultaneous occurrence might be that COF would have displaced 23 resulting in the formation of DC. Calcifying odontogenic cyst (COC) is a term used broadly to define lesions which were either cystic/solid in nature. However, a new term defining dentinogenic ghost cell tumor (DGCT), as its neoplastic counterpart, histopathologically showed the presence of dentinoid-like areas, ghost cells and ameloblastomatous-like odontogenic epithelium. This possesses a great challenge to an oral pathologist in diagnosing and differentiating it from solid multicystic ameloblastoma or COCs so as to ensure the biological behavior and pathogenesis behind its multifaceted nature. The author presents an exceptional case of DGCT, with special emphasis on its pathogenesis, occurring in an 80-year-old female with facial asymmetry and unique histopathology. 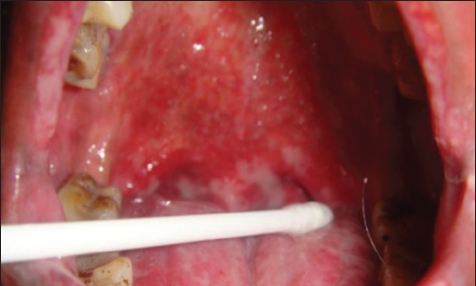 Oral pulse granuloma (PG) is a rare lesion that presents as a foreign body granulomatous reaction to implanted food particles of plant or vegetable origin. It is classified as a central or a peripheral lesion depending on the location. Rarely, a central oral PG may be associated with a cyst or tumor, thus leading to a deceptive histopathological picture. 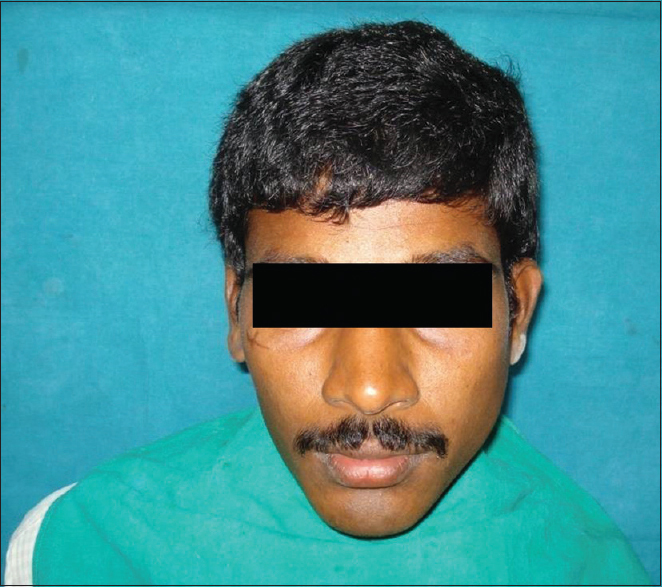 This is exemplified in the present case of 27-year-old female patient who reported with a swelling on the left posterior region of mandible which was diagnosed as ameloblastoma. 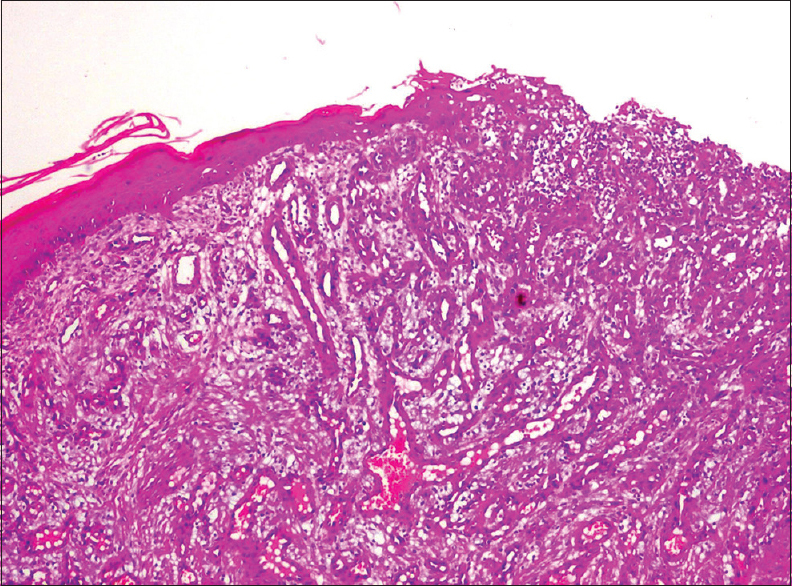 The excisional specimen depicted a varied histopathological picture showing follicular ameloblastoma and foreign body granulomas associated with hyaline rings. Based on histopathological, histochemical and polarized microscopy findings; these hyaline rings were diagnosed to be remnants of a plant cell/legume. 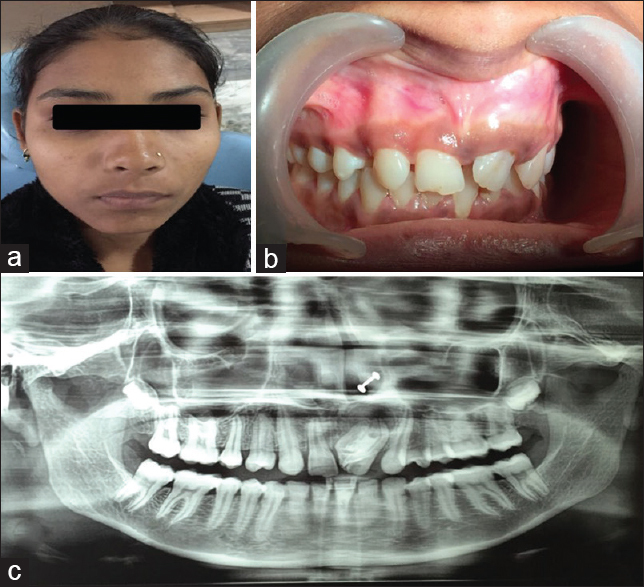 The aim of this article was to present a case of PG associated with ameloblastoma and discuss its histochemical and polarizing microscopic features. The Juxtaoral Organ of Chievitz is a normal anatomical structure located within the soft tissue in the buccotemporal fascia on the medial surface of the ascending ramus. This enigmatic vestigial structure is considered to be of neuroepithelial origin with no known function. As a matter of fact, JOOC is one of the most treacherous pitfalls in surgical pathology with respect to lesions in the head and neck area. Hence the basic aim of this short communication is to reveal the importance about this organ and enlighten the oral pathologist about this histopathological structure, thus preventing extensive and unnecessary investigations. Context: Identification of person living or dead using diverse characteristics is the basis in forensic science. The uniqueness of lip and fingerprints and further, association between them can be useful in establishing facts in legal issues. Aims: The present study was carried out to determine the distribution of different lip print patterns among subjects having different thumbprint patterns and to determine the correlation between lip print patterns and thumbprint patterns. Materials and Methods: The study sample comprised 100 students randomly selected from Bapuji Dental College Hospital, Davangere, Karnataka, 50 males and 50 females aged between 18 and 20 years. Red colored lipstick was applied on the lips by a lipstick applicator brush. Lip and thumb impressions were made on No. 1 Whatman filter paper and visualized using magnifying lens. Three main types of fingerprints (loop, whorl and arch) were identified; Tsuchihashi Y classification of lip print patterns was followed in the study. Chi-square test was used to see the association between lip and thumbprints. Results: The correlation between lip and left thumb print patterns for gender identification was statistically significant. In both males and females, Type II lip pattern associated with loop finger pattern were most significant and in males, Type III lip pattern with whorl type of finger pattern showed statistical significance. Conclusion: We conclude that the correlation found between lip print and thumbprint can be utilized in the field of forensic science for gender identification. Background and Objectives: Biometric authentication is an important process for the identification and verification of individuals for security purposes. There are many biometric systems that are currently in use and also being researched. Tongue print is a new biometric authentication tool that is unique and cannot be easily forged because no two tongue prints are similar. The present study aims to evaluate the common morphological features of the tongue and its variations in males and females. The usefulness of alginate impression and dental cast in obtaining the lingual impression was also evaluated. Materials and Methods: The study sample included twenty participants. The participants were subjected to visual examination following which digital photographs of the dorsal surface of the tongue were taken. 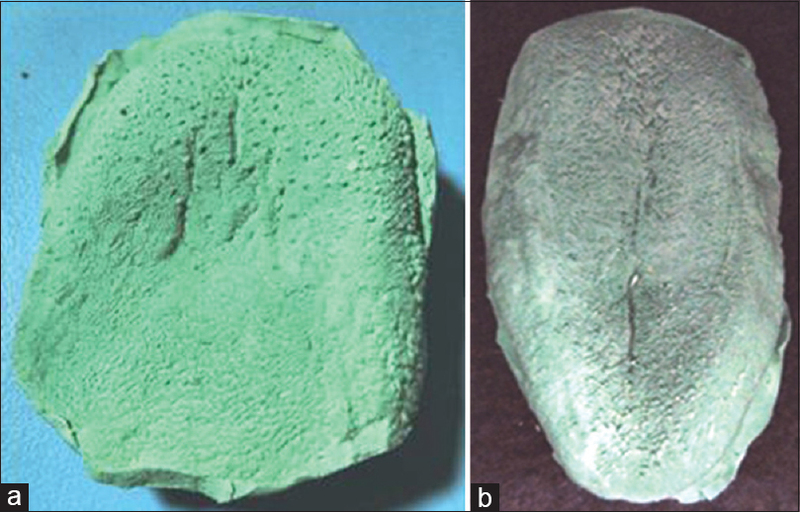 Alginate impressions of the tongue were made, and casts were prepared using dental stone. The photographs and the casts were analyzed by two observers separately for the surface morphology including shape, presence or absence of fissures and its pattern of distribution. Three reference points were considered to determine the shape of the tongue. Results: The most common morphological feature on the dorsum of the tongue was the presence of central fissures. Multiple vertical fissures were observed in males whereas single vertical fissure was a common finding in females. The fissures were predominantly shallow in males and deep in females. The tongue was predominantly U shaped in males and females. V-shaped tongue was observed in 25% of females. Conclusion: Tongue prints are useful in biometric authentication. The methodology used in the study is simple, easy and can be adopted by dentists on a regular basis. However, large-scale studies are required to validate the results and also identify other features of the tongue that can be used in forensics and biometric authentication process. Background: In the literature, many studies were attempted to analyze the distribution of oral reactive lesions in terms of age, gender and location. However, very few studies have focused on the detailed histopathological features of these reactive lesions of oral cavity. Thus, the purpose of this paper is to document the occurrence, distribution and various histopathological features of reactive gingival lesions. 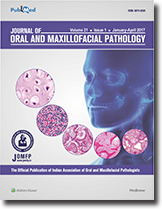 Materials and Methods: This study is a retrospective archival review of reactive gingival lesions of oral cavity such as irritational fibroma (IF), inflammatory gingival hyperplasia (IGF), pyogenic granuloma (PG), peripheral giant cell granuloma (PGCG) and peripheral ossifying fibroma involving gingival tissues. All the cases were histopathologically reviewed on some microscopical parameters according to the criteria given by Peralles et al. Results: Regarding epithelial morphology, atrophy, ulceration and hyperplasia were found predominantly in PG. 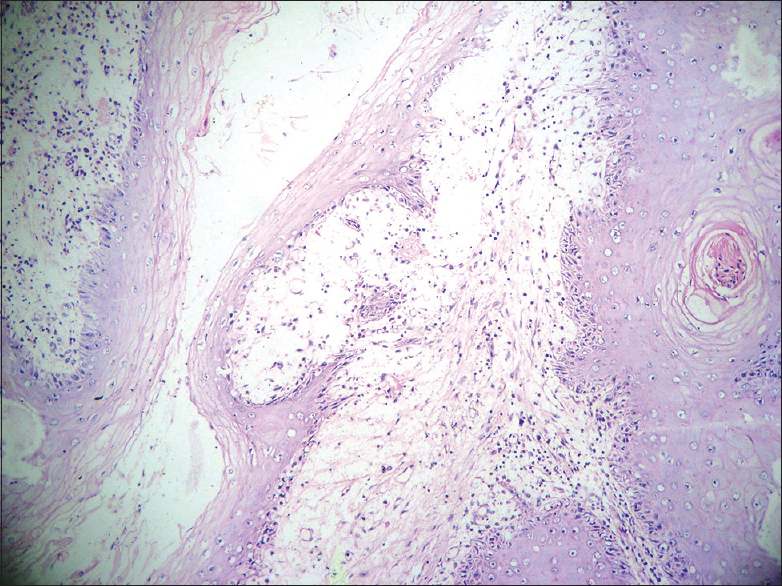 Connective tissue was predominantly dense in IGF and IF with fibroblastic proliferation; whereas loose connective tissue was seen in PG. Vascular proliferation, especially capillary, was commonly present in PG and inflammatory gingival hyperplasia (IGH). Inflammatory cell infiltrate was intense in both PG and IGH. Mineralization showed a marked affinity for peripheral cement-ossifying fibroma, and bone/bone-like areas were found in about ten cases of them. The Foreign body type of multinucleated giant cells was found exclusively on PGCG. Conclusion: Despite their clinical similarities, the findings of this study reports that all reactive gingival lesions show some differences in age, type, location, duration and histopathological features. 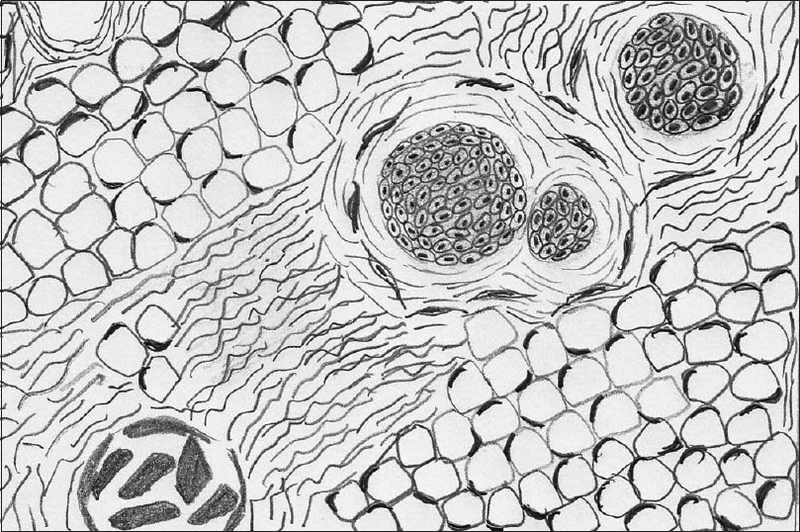 Nevertheless, the differing histological pictures are a range of a single lesion in diverse stages of maturation. 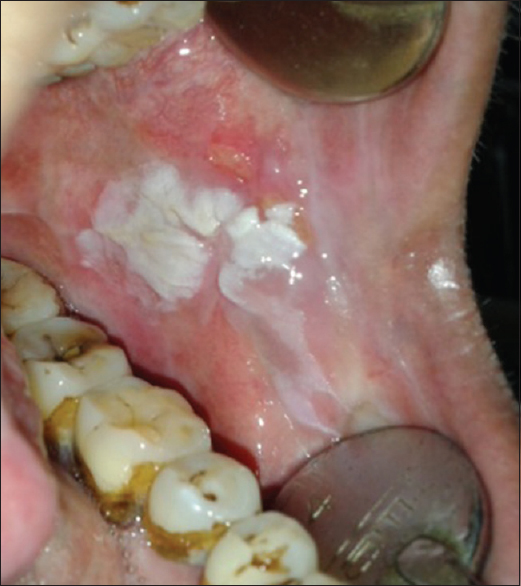 Essential in the treatment of reactive lesions is the total removal of the lesion with local irritants such as defective restorations or calculus formation. 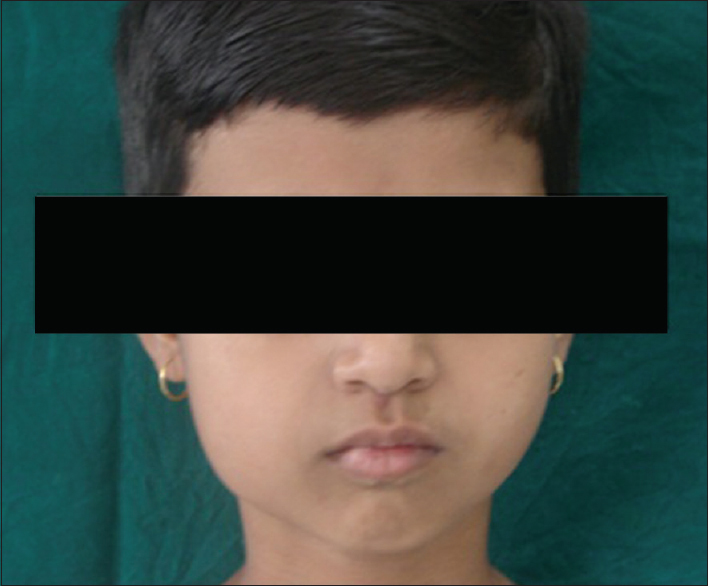 Cherubism is a rare hereditary developmental condition of the jaws and generally inherited as an autosomal dominant trait. It is also known as familial fibrous dysplasia of the jaws, familial multilocular cystic disease and hereditary fibrous dysplasia of the jaws. The gene for cherubism is mapped to chromosome 4p16.3 may lead to pathologic activation of osteoclasts and disruption of jaw morphogenesis. 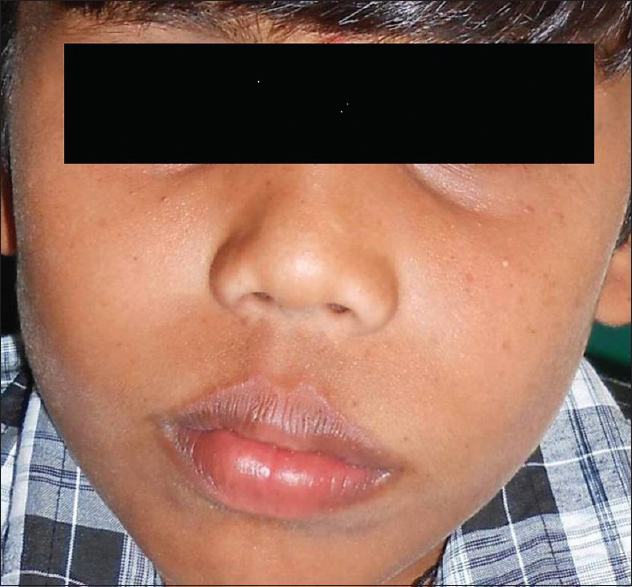 The lesion usually appears between 2 and 5 years shows a predilection for the mandible and causes a bilateral swelling giving rise to a cherubic chubby appearance. The eosinophilic cuffing of blood vessels appears to be specific for cherubism. The diagnosis is based on clinical, radiographic and histopathologic findings. 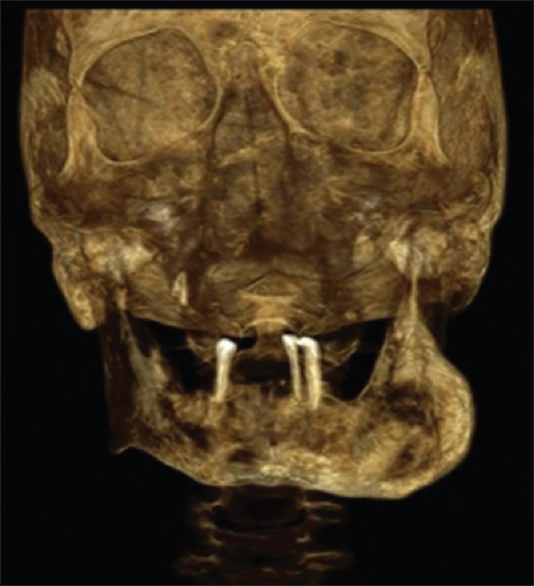 The purpose of this article is to present a rare case of nonfamilial cherubism as there are very few cases reported and to review the literature with its cone beam computed tomography findings. 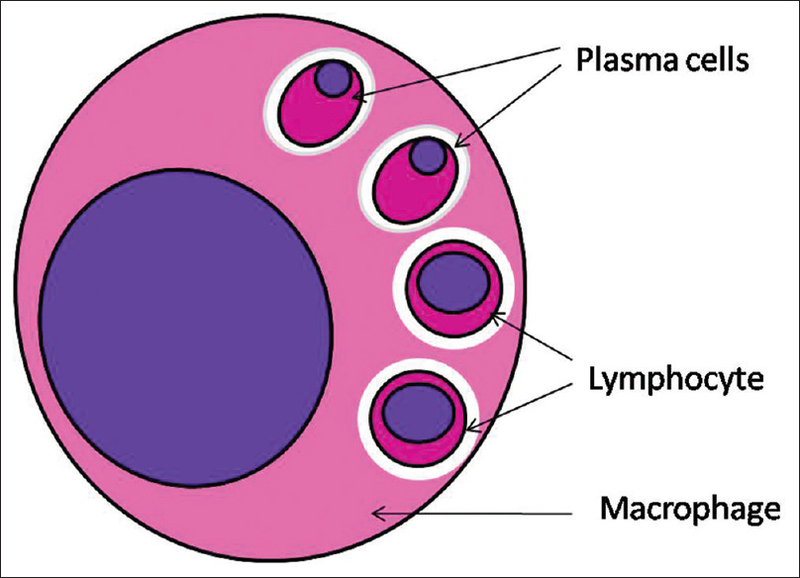 Lymphadenopathy may be caused due to various reasons, most common being infections, neoplasms and immunologic disorders. Considering the frequent use of biomaterials in dentistry, it is not uncommon to find allergic reactions in the oral mucosa. Delayed-type hypersensitivity is one mechanism of allergy, which may manifest as either contact stomatitis or rarely present as only lymphadenopathy. 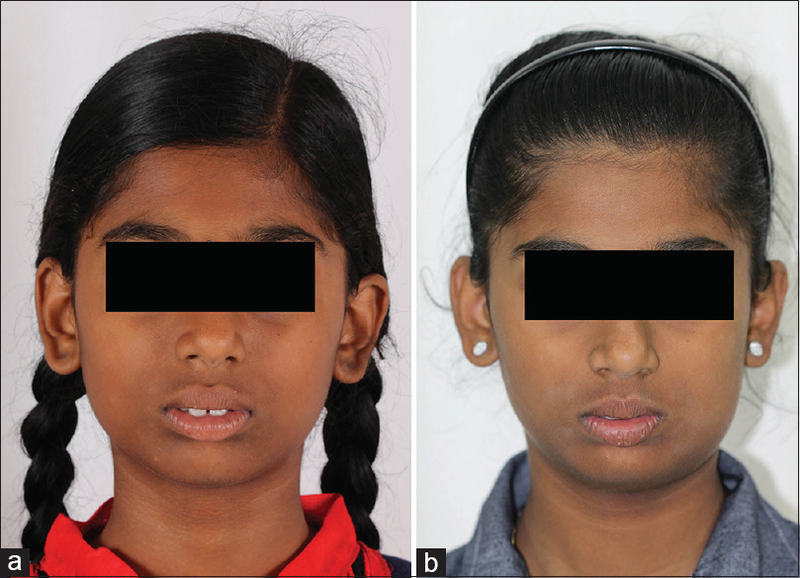 An unusual case of unilateral submandibular gland swelling with associated lymphadenopathy during orthodontic treatment is reported. The processes followed in the differential diagnosis of the condition have been elucidated. Delayed hypersensitivity as a possible causative factor has been discussed. The article highlights the possibility of such conditions manifesting at any time during orthodontic therapy. Primary intraosseous odontogenic squamous cell carcinoma (PIOSCC) is a rare tumor. The incidence is low, and approximately 200 cases are reported in literature. The etiology is associated with the malignant degeneration of embryological remains. Differential diagnosis includes alveolar carcinomas, jaw metastases from other locations, odontogenic tumors, and tumors of the maxillary sinus. However, the diagnosis could be delayed due to the absence of symptoms in early stages. Surgery represents the first choice treatment. Whereas, postoperative radiotherapy could be helpful to improve the overall survival. The prognosis is generally poor. 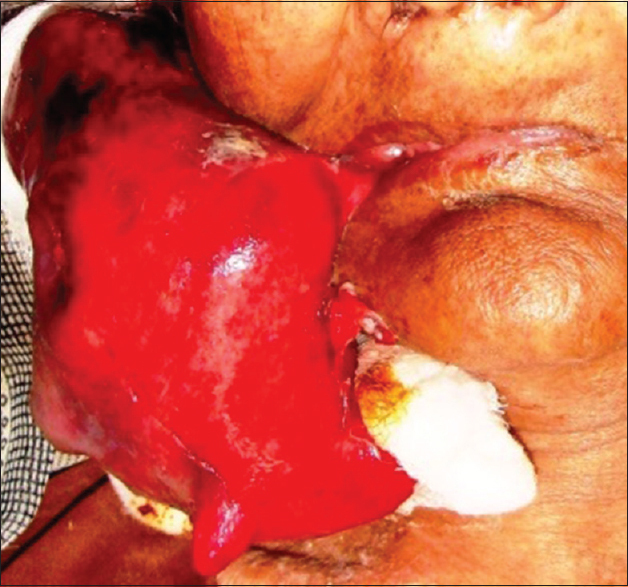 In this report, we describe the case of a 77-year-old man accidentally diagnosed PIOSCC. The patient referred a tooth extraction and cystectomy 3 years before. The pathological examination of the cyst tissue evidenced an inflammatory cyst. However, no patient follow-up was performed. Hence, is important to stress that routine monitoring of patients affected by large inflammatory cysts of the jaw bones should be mandatory. 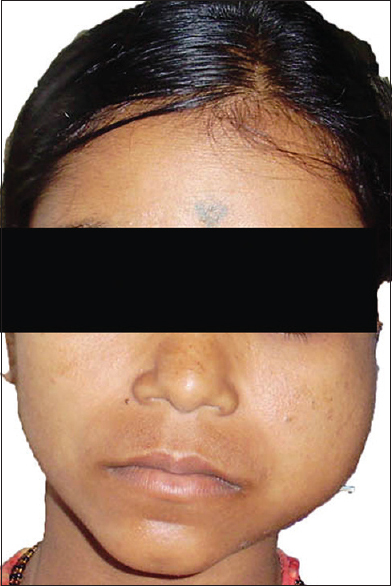 A 42-year-female patient presented with a swelling on the left side of the face for the past 10 years. The radiograph shows multilocular radiolucency with evidence of root resorption. Histopathology reveals fibrous connective tissue exhibiting numerous odontogenic epithelial islands with peripheral tall columnar cells showing a reversal of polarity. The center of the island shows stellate reticulum like cells. 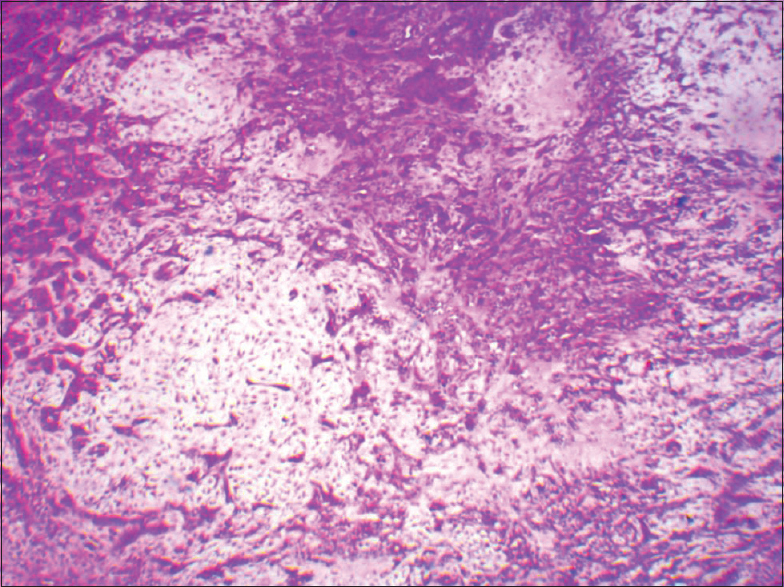 The connective tissue also shows the presence of extensive coarse granular eosinophilic cells distributed throughout the section.